The mission of Pittsburgh's IDA chapter is to protect dark night skies bright with stars for the enjoyment of all. --Every Wednesday meeting for the drone project.6:30 pm meeting at CMU in Wean Hall 7423, same time and place. The group that has been meeting is mostly grad students and roboticists who will be reducing the data. But anyone with an interest in the drone light pollution project is welcome to join us. --Pilot and watcher training at CMU 12 - 6 pm (room TBA) on Sunday, April 28 -- drone watcher training will only take two hours of that time. Mike Lincoln is running this FAA-required training. --Test sites of the new bulbs on Margaret Morrison Drive at CMU starting in May. --Test drone flights as weather and moon permit throughout May and June. This one-day, free conference on light pollution will feature expert speakers from the civic sector and scientific researchers in astronomy, lighting design, biology and medicine, a documentary screening and a release party for the 200-page anthology Triangulation: Dark Skies (60 copies to be given away). Next three IDAPgh.org meetings scheduled! Triangulation: Dark Skies update: We need more light pollution stories! 4 cents a word to 5000-word maximum, Deadline for submission Feb 28, but we are seriously short on science fiction, fantasy and horror stories about light pollution. We have seen plenty featuring dark skies as interpreted as “outer space.” This 200-page anthology will be ready for the June 1st conference at CMU. Bring it down to Earth! The January meeting of the International Dark-sky Association was held at 6:30 pm on Wednesday, Jan. 23, 2019 at Allegheny Observatory in Riverview Park. Free meeting, open to the public, no dues, no membership in the International Dark-sky Association required (but maybe consider it?). Free parking. Updates on the drone project and the Triangulation anthology. 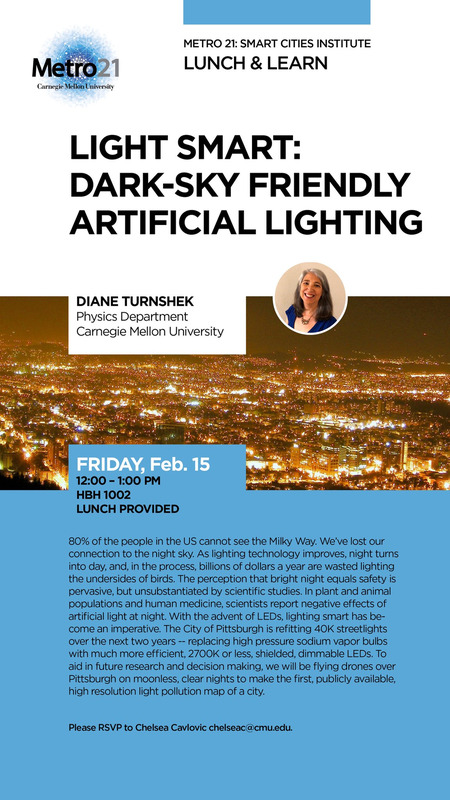 We talked about the City of Pittsburgh lighting ordinances, astronaut ISS photos of Pittsburgh, LLC paperwork and the new star party season of the AAAP. We can see the Allegheny Observatory All-sky Camera in action. The new IDA calendar is out including Michael Lincoln’s astrophotography of Pittsburgh as February 2019! The December meeting of the Pittsburgh Chapter of the International Dark-sky Association (IDA) was held at 6:30 pm on Wednesday, December 12, 2018, Danforth Conference Room in the Cohon University Center at Carnegie Mellon University (5000 Forbes Ave, Pittsburgh, PA 15213). No dues, no registration, open to the public. Please join us for a review of the IDA and Artificial Light at Night meetings in Salt Lake City in November and updates on all our projects. Park for free after 5 pm in the East Campus Garage on Forbes Ave. Take a ticket at the entrance, then put it back in afterwards, when you leave. The October meeting of the Pittsburgh Chapter of the International Dark-Sky Association was held at 6:30 pm on Monday, October 22, 2018, Connan Room in the Cohon University Center at Carnegie Mellon University. The City of Pittsburgh plans to begin changing streetlights to LEDs in 2019. In the works? A new Metro21 grant at CMU to make a light pollution map of Pittsburgh, before, during and after the installation using UAVs. Click here to sign up for our newsletter to be kept informed of news and events relating to the IDA Pittsburgh Chapter. Announcing a new call for stories for a themed anthology of science fiction, fantasy and horror stories celebrating dark skies. Triangulation is Parsec Ink’s themed speculative fiction anthology, now in its 15th year. Everyone is eligible to send in a story. We’re looking for work from new as well as established authors. Triangulation: Dark Skies will be a celebration of the dark. Light pollution is a danger to human health, to animals and plants in the nighttime ecosystem and to the future of astronomical research on our planet. It wastes billions of dollars a year. Glare from unshielded lights causes safety hazards for drivers and pedestrians. We don’t yet know the full effect of making the night in cities 100 times brighter, but it deserves our focused attention. Want to know more? Start at the comprehensive website of the International Dark-sky Association. Storifying an issue is a proven way to engage an audience. The hope is that readers will identify with proactive characters making decisions, experiencing firsthand the dangerous trend to light up the night and suffering the consequences. This issue will be given to attendees at a Dark Sky Conference in June of 2019 at Carnegie Mellon University, then widely available for purchase. This anthology not the place for stories about the creeping horrors in the dark, which we are losing at the speed of light, but rather a exploration of the theme — celebrating our place in the universe and the ability to see into the depths of space. Each story must contain speculative elements. While we’d love to hear about what the sky was like when you were a kid, accepted stories will weave a sense of wonder into an engaging human (or monster, alien, whatever) tale. Imaginative incorporation of the theme is a necessity. Past, present, future accounts. Cautionary tales. Secondary worlds and altered timelines. The effects of light pollution are many and varied – feel free to explore any aspects, from neurobiological studies to life in an alien star system to legends out of time. Word count: under 5000 words (with a preference for stories around 3000 words). No minimum word count. Payment: 4 cents a word on acceptance. Authors will receive an ebook and be mailed one printed copy of the anthology, with the option to buy further issues at one half the cover price (plus shipping). We purchase First North American serial rights and electronic rights for the downloadable version. All subsidiary rights are released upon publication, which is expected to be June 2019. The submission window is December 1, 2018 to February 28, 2019. No reprints, fanfic, multiple or simultaneous submissions. 1.) A rejection with an invitation to submit another story before the deadline. 2.) A request to hold the story longer for further consideration. Congrats on making the first cut. 3.) A request for rewrite, with specifics outlined and a deadline for resubmission. We hope to have all responses sent by March 31. Annually, Triangulation has been receiving about 900 story submissions for about 20 spots. The purpose of the anthology series is to give Pittsburgh writers a chance to see what it’s like to sit on the other side of the desk. Editors change every year or two. Each editor picks the theme for their anthology. We’ll be looking for new editors in 2020.